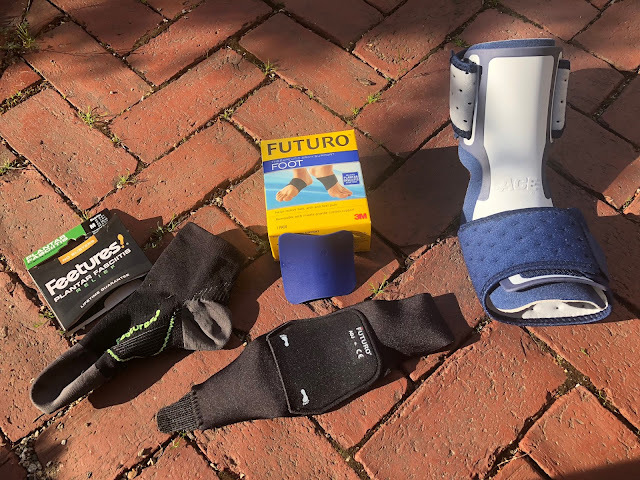 Road Trail Run: Plantar Fasciitis-How to get a grip on the Runner's Big Pain. Tips and tools for quick and effective relief. Plantar Fasciitis-How to get a grip on the Runner's Big Pain. Tips and tools for quick and effective relief. 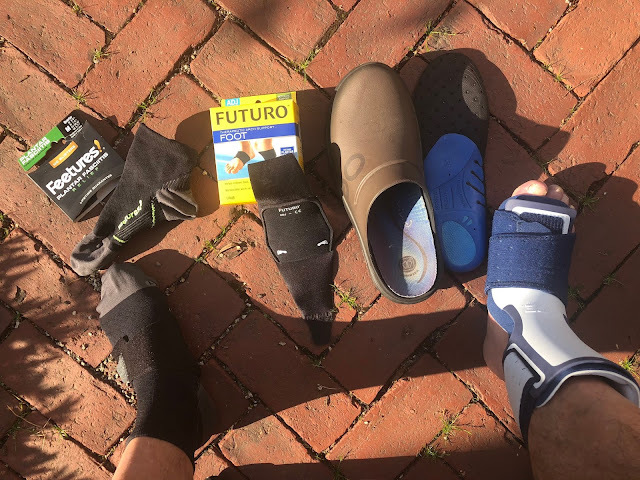 The article outlines how I took action to tame a recent onset of Plantar's Fasciitis. I am not a medical person but believe the tools and suggestions below are effective. Plantar Fasciitis is a very common running injury characterized by pain in the heel and bottom of the foot. Not just runners those standing, obese, or not doing much exercise can get it too. According to this Wiki between 4-7% of people have heel pain at any given time and 80% of them have Plantar's. Plantar's is "a disorder of the insertion site of the ligament on the bone characterized by micro tears, breakdown of collagen, and scarring." Most runners at some point will get Plantar's. It can be caused by overuse, changes in terrain or surface, increased volume or intensity, tight calves and achilles as well as inward rolling of the foot say in overly soft run shoes. Well, after 7 years with no Plantar's and since my marathon in early April about a month ago, I have had some very mild occasional heel pain. Last week I overdid it...most often the cause of an onset of Plantar's. 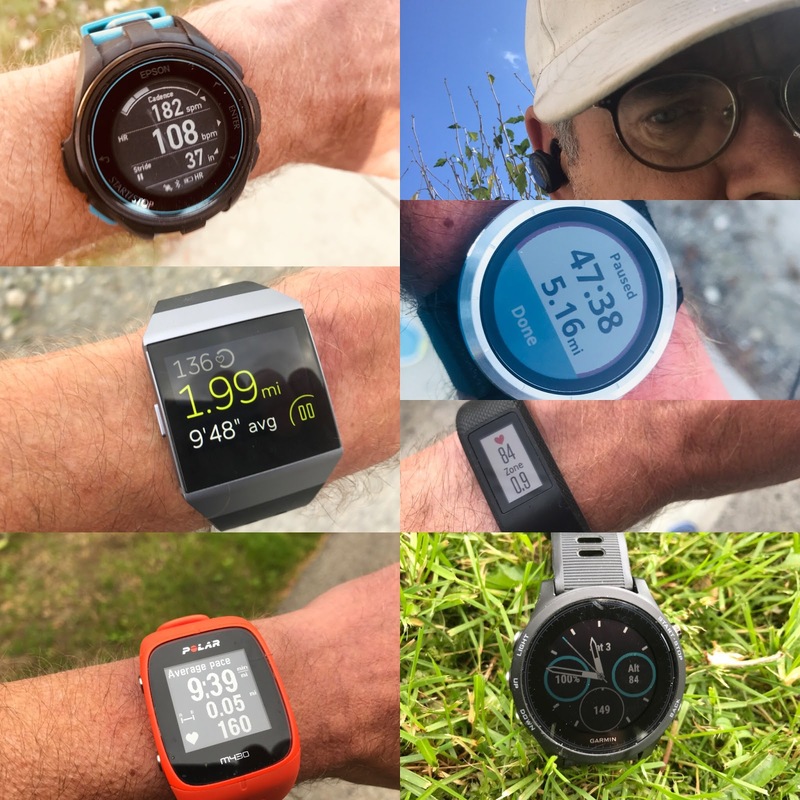 On Monday I ran a hard 6 mile tempo in soft shoes, Tuesday a tough treadmill up hill workout, Wednesday a 10 mile trail run on moderate terrain.I I had issues until mile 8 or so where the trail went steeply uphill for about a mile. At the top I could feel significant heel pain and limped it in back to the car. While overdoing it was clearly part of the picture I wonder to if the general inflammation caused by my seasonal allergies may also be part of the cause. My last bout was in spring as well. I knew it was Plantar's Fasciitis or the beginnings of it. I went right to work putting my "kit" together. I ran "through" my last bout caused by a rapid change of not only pace but terrain ending up with 6 months of misery and didn't want to go through that again. Once big damage is done to the Plantar's it takes a long time to heal as there is very little blood flow in that area of the foot. The first key step is supporting the arch at all times. The Sidas went right into my soft OOFOS Cloogs. It is important to have soft cushioning but also stability to keep the foot supported under the arch, aligned and still. 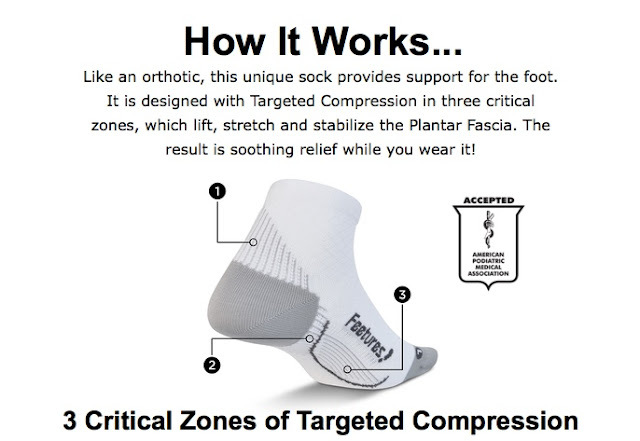 I went by my local running store and picked up a pair of Feetures Quarter Plantar Relief Socks ($30). They are a very compressive running sock with powerful under arch and achilles support and pair very well with the Sides and Futuro Arch Support described below. Then I was off to Wal-Mart to see if they had a sleeping sleeve. During my previous bout I used the famous Strassburg Sock, a nasty contraption with strap extending from the toes towards the shin. Keeping the toes when sleeping extended towards the shin is important to relieve stress on the Plantar. I never made it through the night with the Strassburg as it was very uncomfortable. 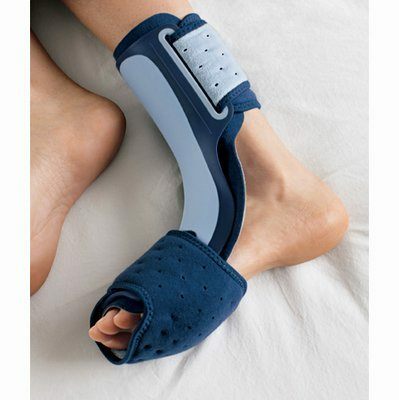 Low and behold for the princely sum of ($18.780 Wal Mart had the Ace Brand Plantar's Fasciitis Sleep Support, a stiff curved plastic front piece which is strapped around the calf and then toes pointing up with super soft comfortable straps around the arch. This is the key sleep tool replacing the Strassburg Strap. I have had zero issues sleeping through the night with the Ace. It is remarkably comfortable and upon wake up when Plantar's is worst for the first minutes of walking almost no pain. At Rite Aid I found the Futuro Therapeutic Arch Support ($20). A snug but soft strap they are backed by rigid plastic plates-two stiffnesses are provided I stayed with the slightly less rigid one. The plates mold to the arch supporting it fitting into a pocket on the strap. 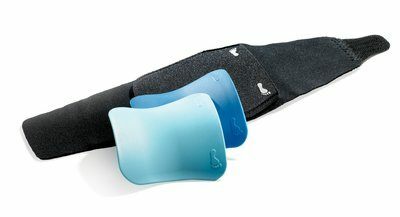 I had tried a gel padded arch support but found it uncomfortable. I have used them continuously since except at night. Of course rest was in order so I took a day off...The day after I wore the the Feetures and Futuro in a pair of ASICS GEL-Nimbus 19. One of our reviewers Derek Li, a physician in Singapore where he is known as the "Running Doctor", suggested a firmer stable shoe rather than a softer one. No issues during or after the run beyond a touch of heel pain. As always if pain makes you limp or affects your gait you shouldn't run, so walk easy or take the day off. Some motion is good to get blood flowing to the arch area, The Plantar's area is notoriously low in blood vessels so healing is often long that is why I took immediate action to prevent further more chronic damage. I took the next day off as I had family obligations. The day after I ran 5 miles in the GEL-Cumulus 20 another stable shoe neutral, a bit of pain all the way but key no worsening as a result I ran 6 miles on the flats on a treadmill the day after at a slow pace. The treadmill deck has a bit more give than the road. Today I ran 6 miles of moderate trails taking care not to push the uphills with very little and decreasing pain. For all runs I wore the Feetures socks and Futuro Arch Support. After runs I change to the OOFOS Cloogs with the Sidi insoles with the Futuro still in place. At night I wear the Ace Sleep Support. I believe I am making rapid progress but remain cautious in my training. With care and more stretching of my calves I believe I have licked a potentially serious run stopper. If you feel Plantar's coming on, take immediate action so that the condition doesn't worsen to a run stopping situation. Thank you for your advice! This is me right now! I have been battling plantar's and some achilles irritation for a couple of months now and feel like it's never going to go away. It has definitely settled some, but I still feel it if I start to run too much again. 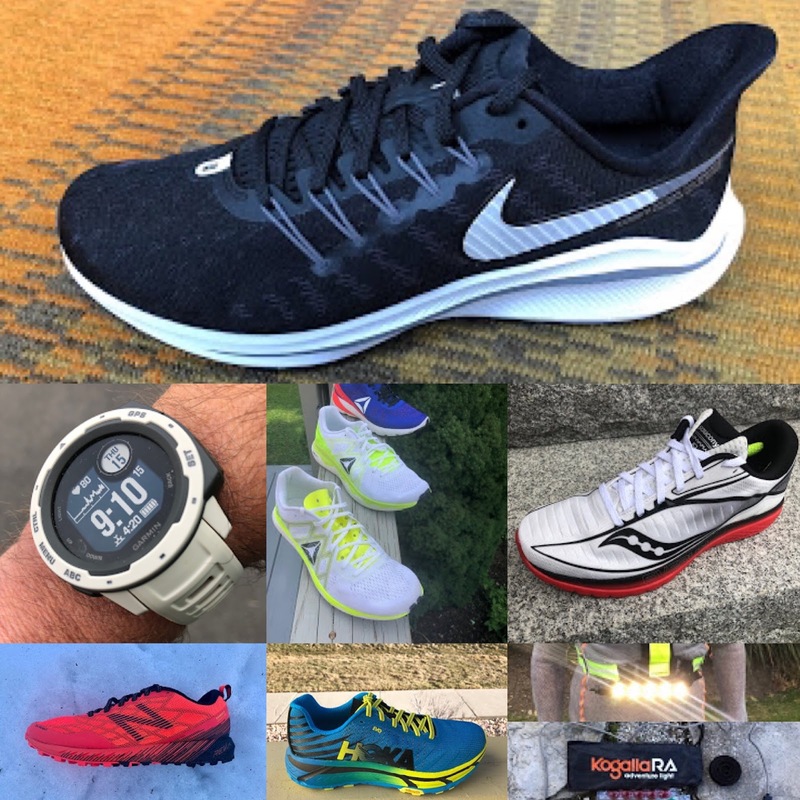 What shoes do you typically find help and give relief when you are going through a "flare"? Thanks! I have had the best luck with super feet insoles. I have not had a problem since. I also use Fastwick socks. I have found daily rolling with a golf ball, and heel drops three times a week that strengthen the foot, AT, and calves are a must. Of course, the hard easy training method, and not adding too much speed or distance/hills is key too. Staying away from too soft shoes seemed to help me too. Another help for your readers is graduated compression socks. 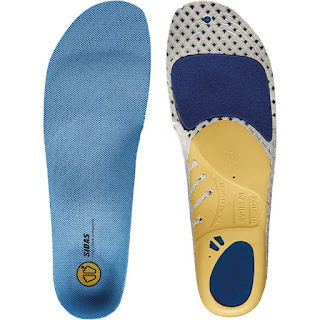 These help support the foot and bring blood flow to the area too-to enhance healing. Helps with AT and calf problems, in my experience. Hang in there, and hope it gets over with quick! Hi Anonymous, Thanks for encouragement and compression sock advice. Yeah 3 days in a row fairly hard and a change in terrain all during allergy season when things are more inflamed to begin with not smart. I am clearly on the mend but will remain vigilant ! I've had good luck with massaging my legs with a bar and rubber ball on specific pressure points. It's amazing how working on one part of the legs affects other tissue. I have some Peroneal and Achilles Tendonitis issue and sometimes Planters that pop up and taking care of the leg muscles, pressure points and Facia really helps. Sorry to hear. If you have had a while you will have to wait it out. Key is that arch support at all times and as you are already deep into it approaches to get the blood flowing and break it up. As far as shoes firmer and more stable I think this is the way to with a good arch supporting insole and with the straps in the article. Hope you recover soon. Could you do a piece on Achilles tendinitis? After losing count on the tens of (scientific) articles I have read, most external measures arenod very limited usefulness and efficacy. I would advise reading about the Windlass mechanism. BOLGLA, Lori; MALONE, Terry - Plantar Fasciitis and the Windlass Mechanism: A Biomechanical Link to Clinical Practice. J Athl Train. 2004 Jan-Mar; 39(1): 77–82.